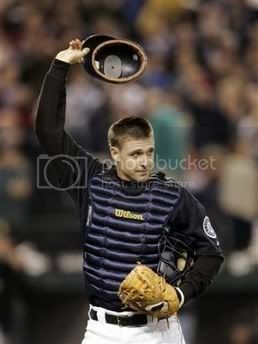 Dan Wilson was once an All-Star in 1996. In his later years, I had wished that the Mariners could get a younger catcher with some pop and more speed than Wilson, who I attached to a sure out whenever there were two out in an inning, and I'd developed a pretty good record of knowing when he was going to roll into a double play with runner(s) on base. As much as I'd stood by my opinions (this could also get irrational, given those were my late teenage years) on replacing Wilson, the bottom line is that Wilson held off Ben Davis and Miguel Olivo. Wilson was felled not by any player trying to take his job, but only by an ACL tear. Years went by and Daniel Allen Wilson was there from 1994 to last night. A former hockey goalie, he used some of the same skills to stop balls in the dirt and combined this with a stellar ability to know his pitchers -- what they have that day, what they have to work with -- and call the game, no doubt taking some of the burden off his managers. His ability to block balls gave confidence to his pitchers, enabling them to thrown everything they had and know it wouldn't get past unless it was well over Dan's head, and such pitches would be grossly high since Wilson was 6'3". It wasn't just Jamie Moyer that could throw a changeup in the dirt and get a swing and miss. We're talking Randy Johnson's slider down and in to righties, we're talking Kazu Sasaki's thang, we're talking Jeff Nelson's frisbee slider two feet outside to a righty, we're talking dealing with Jose Mesa and Armando Benitez (though nothing could save Benitez), etc. Lest we forget Wilson having to deal with Lou Piniella as well. Surely Dan had to calm a young pitcher or two down after Lou sank his teeth into an unsuspecting young'un on the mound. Sure, I'd begged over the years for Wilson to finally be off this team. However, all I needed was the revolving door at catcher this year to know (much more than before) that Wilson's value couldn't only be measured with offensive statistics. He handled the Mariners' pitching staff over the last decade with outstanding results, and he had a feel for the game behind the plate. After his injury, the Mariners and especially the pitching staff this year sorely missed him and everything he brought to the game. Therefore, I missed him. And I'll continue to do so. There's no way a particular high school classmate is reading this, but if you're reading this, Kate, you won. I'm rarely this happy when I end up being wrong about something. Such is life, and such is baseball.